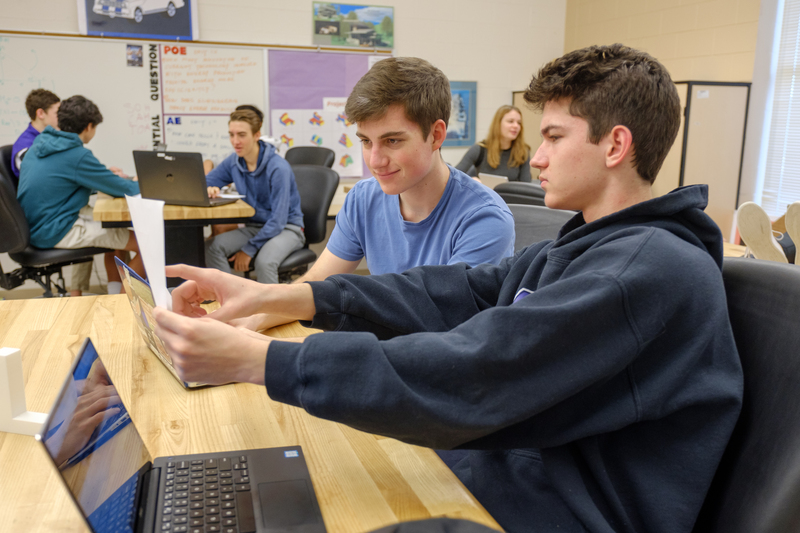 Project Lead the Way (PLTW) engineering classes are in their third year at Carrboro High School, and the program is more popular this year than ever before. The number of students involved in PLTW has increased since CHS introduced its first class within the program: Introduction to Engineering. The number of students in the program has roughly doubled each year, according to Jeffrey Arthurs, one of the classes’ instructors. “We’ve got a lot of recruitment with eighth graders, people getting ready to come over here to get them excited about it; I think that has helped a lot,” said Arthurs. The bulk of students are in the freshman class, according to another instructor within PLTW, Caroline Morais. The increase in the number of the stu- dents in PLTW classes has also increased the number of STEM-focused students at CHS overall; many of them are becoming more interested in the field, with some even moving in the direction of majoring in engineering at uni- versity. PLTW classes are a special type of elective, as all of them are AP-weighted even though they aren’t AP listed. This is done mostly to encourage enrollment, as they positively affect students’ GPA. “We’ve talked to admissions people at the university level, and they all say they weigh very heavily people that have taken Project Lead the Way courses,” said Arthurs. With the benefit of AP credit and interesting and engaging courses, many students are trying out PLTW classes and becoming more interested in engineering. Most come to the classes with previous experience or interest, but many others without previous experience are becoming more interested in the field thanks to PLTW.